ISIS Drove Them From School. Now The Kids Of Mosul Want To Go Back : Parallels A boy from Mosul, now in an Iraqi camp, quit school after ISIS took it over. "The children were terrified," says his mother. "They should be playing, and instead it was blood, blood everywhere." Displaced Iraqi children who fled Mosul with their parents sit outside their tent at a camp for internally displaced people in Hassan Sham, east of Mosul, on Nov. 12. Many children stopped attending school because of the ISIS takeover and their parents are eager to see them back in the classroom. About 1 million people have been living under ISIS in the Iraqi city of Mosul for more than two years. Hundreds of thousands of them are children. 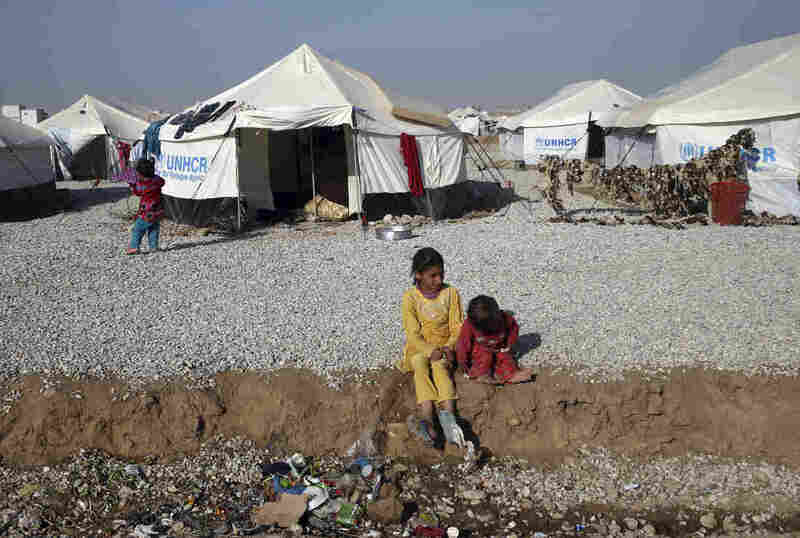 As security forces press an offensive on the ISIS-held city, children are among those escaping and living in camps for the displaced. A mother and her son — who don't give names because they're still afraid of ISIS — talked about how the little boy, who's about 10, used to enjoy school. "Yes, I used to like it," he said. "But I stopped going since they came." ISIS arrived in summer 2014 and changed the curriculum. "They showed us how to make a grenade, how to load a machine gun," the boy said. They also incorporated bullets and bombs into math puzzles, and showed children how to commit acts of violence. Iraqi children follow instructions given by a teacher (center) during an outdoor class at the Hassan Sham camp on Nov. 10. He went home and told his parents. "I told them one day about the lessons I was getting in school, and my mom told me, 'Stop going,' " he said. But his mother says removing him from class didn't protect him from exposure to ISIS. "They would tell the children, 'Come and watch our heroic acts,' " she said. "They would slaughter people in public. The children were terrified. They should be playing, and instead it was blood, blood everywhere." Many of the people now coming out of Mosul speak of ISIS deliberately indoctrinating children — at school, at summer camps, even at public executions, which they would encourage children to participate in. 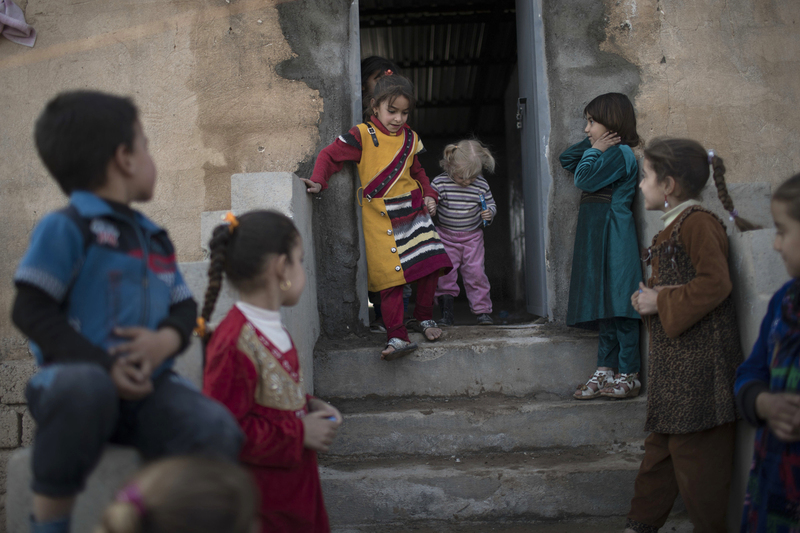 Iraqi teachers working with the displaced children say their ordeal is reflected in their behavior. Zainab Abdelaziz steps out of a math class to talk. "They're rough," she said. They are violent, she explained, especially the older ones. 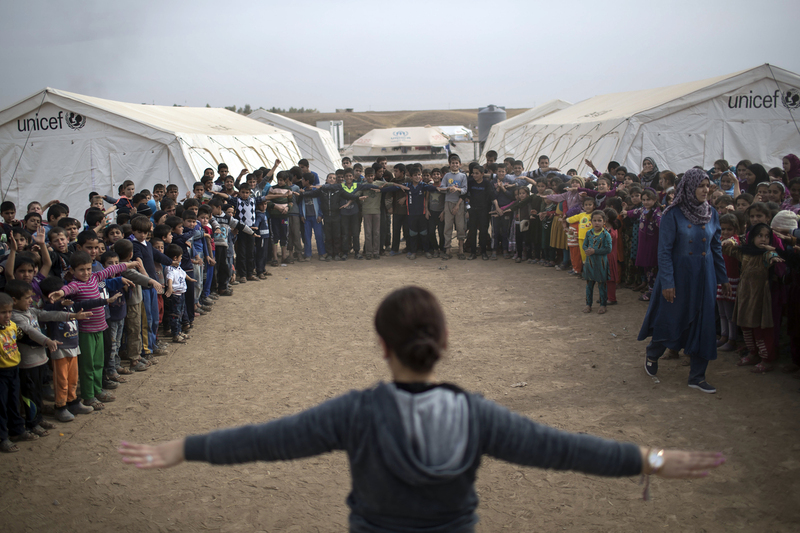 She's experienced and knows that Iraqi children saw violence even before ISIS. But she said these children are faring worse than those who were not exposed to ISIS. Still, she said, "They can change." When they go to school, learn about tolerance, interact with other kids, she said, they change. Iraqi children play at the Hassan Sham camp on Nov. 9.
International aid agencies say setting up basic classrooms should be part of emergency help for children caught up in conflict. The Hassan Sham camp tents are run by the Norwegian Refugee Council with help from UNICEF. "Even if it is a tented school, knowing that every day they can go there, that it's a safe space where they can meet other children, they can go back to some learning practices, it's of critical importance," said Isabella Castrogiovanni, a UNICEF regional child protection specialist. Castrogiovanni has seen the benefit around the world of providing regular school access to children in conflict regions. In Afghanistan, after the fall of the oppressive regime of the Taliban, she recalled lines of girls waiting to go back to school for the first time in years. "I remember those lines, huge lines of girls, all getting ready to go to school, and this has a huge impact in the psychological well-being of children," she said. I asked that little boy in the camp how it felt to be back at school. "The happiest," he said, his face brightening. Then he went to play soccer with his brother.